Do you ever find a piece of clothing that you love……”except”? That’s my shopping experience all too often. Often I find a dress I love, but I wish it was a little shorter. The perfect top, except that I’ll have to layer it with a camisole because the neckline plunges a bit too far. We’ve all been there. Luckily, though, eShakti solves these, and a multitude of other, fashion dilemmas. I was over-the-moon thrilled when I discovered eShakti. I figured everyone knew about it, but as I’ve talked with my friends I’ve found that most of them have never heard of it. So, I’m here to share it with you. 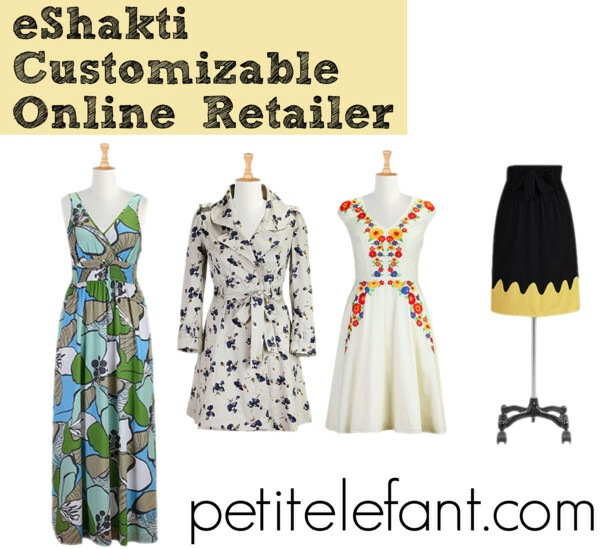 As an online retailer, the thing that sets eShakti apart is the ability to customize the pieces you order. No joke! Let’s say you find a dress that you love on their site (and you will, because the clothes are darling). To begin with, the size range for their clothing is amazing. Most items are offered from XS-6X. Woot! After finding the size that works for you, you will be asked to enter your height. Why? Because they will custom tailor the length to you. But wait! Don’t like the standard length? That’s fine. For a small fee ($7.50) you can request a longer or shorter hem: Making a tea length dress hit just below the knee, for example. Many offerings also include customization of the neckline and sleeves. No more passing on a dress because it’s sleeveless and you feel uncomfortable with that. No more layering with a cami because you’re short and a v-neck drops a little too low on you. This opens up so many options for the plus size woman (and all women, really)! Here are a few of my favorites on eShakti right now. *I was in no way sponsored by eShakti for this post. I just love the idea of offering customization for clothing. I love their stuff! It always comes out perfect and if you don’t like the sleeves or the length you can change it !